Safety is our highest priority in every aspect of all of our programs. At WB Surf Camp, it is our greatest mission to ensure all campers and staff have the necessary tools, training, and equipment to safely participate in our programs. We begin by providing participants with the best gear and performance learning-surfboards available on the market. All of our surfboards are equipped with specialized state-of-the-art rubber tipped safety fins to minimize the risk of fin cuts. Beginners comfortably learn skills one step at a time in small group settings. Our industry-leading student-to-instructor ratio allows us to give individualized attention while simultaneously challenging campers to achieve their greatest surfing goals. Together, our professionally trained employees offer over 150 years of surfing experience to provide the highest-level, professional surf training. We comb through hundreds of applications every year and hand select only the best to join our team. All employees must go through our comprehensive in-house certification program before they are granted the responsibility of student instruction. Our team consists of professionally trained educators with 1000+ teaching hours to all types for students of all levels. This is no ordinary staff. We only employ the highest quality individuals with overlapping and complementary qualifications. Together, our staff possesses deep knowledge and an impressive base of experience, including an Ocean Safety Director, an EMT, and a Wilderness First Responder. All WB Surf Camp instructors are American Red Cross Lifeguard, CPR, Water Safety, and First Aid Certified. Most importantly we also have a burning desire to better ourselves in every aspect of our programs. We utilize consultation and training from Ocean Safety experts outside our organization for continuing education. We value and incorporate feedback from students, staff, and parents as we continually evaluate and better our policies and instruction-methodologies. All our quality control policies and procedures take valuable resources to implement and carry out. At the end of every day, your utmost safety and quality experience mean everything to us. We want you to have an unforgettable adventure that will change your life forever! All beachgoers must be aware of the potential for dangerous rip currents. Rip currents are powerful, channeled water currents flowing away from shore. They typically extend from the shoreline, to the surf zone, and past the breakers. Rip currents can occur at any beach with breaking waves. Green Flag: Calm Conditions. No specific risks have been observed, however, swimmers should always remain alert to their surroundings. Yellow Flag: Use Caution. Do not enter the water unless you are an experienced ocean swimmer. Red Flag: Dangerous Conditions. Do not enter the water. Any of the above clues may indicate the presence of rip currents. Rip currents are often not easily identifiable to the average beachgoer. For your safety, be aware of this major surf zone hazard. Polarized sunglasses make it easier to see the rip current clues provided above. Be cautious at all times, and always swim at a beach where there is a lifeguard on duty. If in doubt, don’t go out! Because of these adverse health effects, you should limit your exposure to UV radiation and protect yourself when working, playing, or exercising outdoors. Also, don’t be fooled by clouds. Depending on the thickness of the cloud cover, it is possible to burn on a cloudy day, even if it does not feel very warm. Protecting yourself from overexposure to UV radiation is simple if you take the steps listed below. Limit time in the midday sun as much as possible . The sun’s UV rays are strongest between 10 a.m. and 4 p.m. To the extent you can, limit exposure to the sun during these hours. Watch for the UV Index. The UV Index provides important information to help you plan your outdoor activities in ways that prevent overexposure to the sun’s rays. Developed by the National Weather Service (NWS) and EPA, the UV Index is issued daily in selected cities across the U.S. Wear sunscreen. Apply a broad-spectrum sunscreen of SPF 15+ liberally and reapply every 2 hours, or after working, swimming, playing, or exercising outdoors. Wear protective clothing . Sunglasses that provide 99 to 100% UV protection will greatly reduce sun exposure which can lead to cataracts and other eye damage. Check the UV label when buying sunglasses. A hat with a wide brim offers good sun protection for your eyes, ears, face, and neck – areas particularly prone to overexposure to the sun. Tightly woven, loose-fitting, and full-length clothes are best for protection of exposed skin. Seek shade. Staying under cover is one of the best ways to protect yourself from the sun. Also steer clear of tanning beds and sun lamps that can increase the rate of skin and eye damage. Protect the ozone. Use natural products instead of chemical cleaning agents, soaps, and sprays that contain ozone-depleting substances. Remember, everyday sun exposure counts! You don’t have to be actively sunbathing to get a damaging dose of the sun. Take care and apply sunscreen even when having lunch outside, going on field trips, taking part in afternoon activities, or participating in a sport. Inform your friends and family about these sun-friendly health tips so everyone can have a fun and safe summer! When at the beach this summer, it’s important to know some simple beach safety rules to protect you and loved ones. These tips will help you stay safe in, on, and around the water. Check out the beach when you arrive. Take care when bathing and swimming. Beware of rocks, piers, groins and breakwaters. Be aware of dangerous rip currentsPay attention to the local weather forecast and tide charts. Look out for information, such as warning signs and flags. Never swim where a sign says not to, or when a red flag is flying. Swim with a friend – never go on your own. Make sure there are lifeguards on duty – you might need their help! Listen and take advice from lifeguards. Make sure you know how to swim, or take swimming lessons before hitting the water. Don’t mix alcohol and swimming. Wear sunscreen, sun glasses, and light weight clothing to protect your self from the sun. Wear foot protection so you do not burn or cut your feet. Call 9-1-1 immediately or contact a lifeguard. kick board or even an empty gallon jug. Take a CPR/First Aid certification course with your local Red Cross – you may save someone’s life! Don’t disturb a sea turtle that is crawling to or from the water or laying eggs. Please be quiet and watch from a distance. Avoid shining lights on the beach at night so you don’t scare away nesting females or interfere with hatchlings crawling to the ocean. Avoid walking or cycling in places posted as nesting/protected areas. Immediately report any injured or dead sea animal to the nearest Beach Safety employee. Do not disturb markers over sea turtle nests. Don’t disturb nesting sea birds. Don’t litter. Cigarette butts, fishing line and other trash can harm the animals and birds along the beach. Help out by picking up beach litter and putting it in the trash. Follow these simple beach safety tips to ensure a safe summer of fun in the sun! Respect the environment. Surfers are often considered ocean ambassadors and should promote the health of our beaches and ocean. We depend on a clean and healthy ocean, so always properly dispose of any trash you encounter on the beach. Maintain a positive attitude! Surfing should be fun for you and everyone else in the line up. Respect others and share waves. Follow the local laws at the beach you visit. Different beaches maintain different sets of laws (i.e. surf zones, surfing near jetties and piers etc. ), so check with a lifeguard for relevant laws before you enter the water. Wear a leash. Not only is it a law at many beaches, but wearing a leash is an important way to keep your board close to you and to keep it from becoming a hazard to other surfers. Always aid a fellow surfer or swimmer if he/she encounters trouble in the water. The ocean is a dynamic environment and there are many safety hazards including rip currents. Should another surfer or swimmer encounter a problem, immediately offer assistance. Everyone who surfs should be certified in CPR and Basic First Aid. Keep an eye out for changing weather conditions and always be aware of the dangers of sun exposure. If in doubt, ask a life guard, they are there to help and are our friends! If you’re a beginner, avoid surfing in crowed areas while you are learning. When paddling out and while in the line up, always be aware of other surfers and swimmers in your area. Knowing roughly where bathers and surfers are located will help you determine when it is safe to paddle into a wave. Avoid paddling directly into the area where the waves are breaking (the impact zone). This is important for several reasons. First, if you choose to paddle out in a channel or in a rip current, you will spend less energy. Second, you will be less likely to encounter a surfer riding the face of a wave. When paddling out, be aware that a surfer actively riding a wave has the right of way. As a paddler, it is your obligation to avoid a surfer on a wave. When two surfers paddle for the same wave, the surfer closer to the peak has the “right of way”. Do not snake! A snake is someone who aggressively positions him/herself in front of another surfer who otherwise would be in position to catch the wave. Remember to always respect other more experienced surfers and share waves. Call out “left” or “right” to designate which way you will turn as you drop in. This is especially important when two surfers positioned close together near the peak of the wave. Duck dive when possible. ONLY abandon your surf board if no one is around. If you are just learning take some lessons from a professional and insured surf school or better yet attend a week long camp. Learning, understanding, and following these basic surfing etiquette guidelines are a must for any surfer. If you encounter someone who fails to respects these rules, gently remind them by explaining the situation with a positive attitude. If everyone just shows some respect, the line up will be a safer and friendlier place! Remember, the best surfer at any beach is the one having the most FUN!! There is nothing more important in surfing than following good surf etiquette. It keeps all levels of surfers safe while enjoying the sport that we love in a respectful and organized environment. Knowing this set of universal guidelines, based on sharing and respect, ensures everyone catches waves and no one gets hurt. The very first thing that novice surfers should know is that the old salts and true watermen, the guys and girls who have been surfing for a long time, are very serious about taking care of the ocean and being stewards of such an amazing gift. This results in a very intense subculture of highly sensitive brothers and sisters who work hard to maintain a clean beach and a clean lineup. Something as small as picking up a piece of trash lying on the beach or passing a wave off to a fellow surfer keeps this environment intact. Surfing is synonymous with peace, serenity, harmony, and healing. Some of the most memorable and cherished experiences we have are set to a backdrop of glassy head high waves with our best friends. We are blessed. We know it. And we’ll do whatever it takes to protect this gift, share it with others, and pass on the knowledge of how to foster and care for it. Sometimes as the waves grow bigger and more intense, surfers themselves can become more aggressive and intense. Due to the dangerous nature and rarity of bigger waves, surfers cherish them more and have to become more aggressive to catch them and protect them. Following the laws of surfing etiquette will ensure that everyone remains friends and stays safe. The lineup is a unique environment. It can be potentially dangerous with more experienced surfers jockeying for positioning for the next wave. It can also be a friendly place, where surfers meet, catch up with each other, and chat. The lineup is the area past where the waves are breaking and surfers sit and wait for the perfect set. 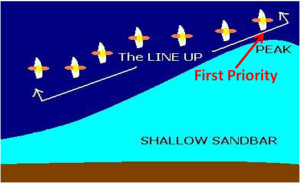 In an ideal situation, the lineup will look like a single file line, running parallel to the beach, waiting for their waves at the peak (where the wave first breaks). As the surfer closest to the peak takes a wave, the rest of the lineup moves so that the second person in line is now first. Not all lineups will be as organized as this but it is extremely important to follow the rules even if others are not. Most importantly, beginners need to stay safe. If you are surfing away from others, there is a much smaller chance of colliding with another surfer or being injured by another surfer. As beginner surfers, people are more self conscious about their surfing. Surfing alone or away from a group will allow surfers to feel much more comfortable in the water resulting in faster progression and more fun. No one wants to feel nervous in the surf. In most cases the crowd determines the peak. What this means is that the break with the most surfers on it is usually the best spot on the beach. A beginner surfer is working on the fundamentals of surfing and therefore is more concerned with quantity of waves rather than the quality of the waves. Last but not least is the simple fact that by surfing away from other surfers, you can catch many more waves. In a crowded spot there is a pecking order, rules to follow and you’ll have to share waves with other surfers. When you surf alone, you are free to pick whichever wave you like. If you find yourself surfing in a crowd, be sure to sit far outside so as not to be in the way of oncoming surfers. Never sit directly in front of another surfer while in the line up. Should a surfer turn around and start paddling for a wave, they may end up colliding with you. Effective communication is crucial in surfing. Asking “Left or right?” is always a safe bet. Wave Priority refers to the surfer that has the “right of way” while surfing on a wave. The peak is the part of the wave that will break first and peel either right or left. The surfer closest to the peak has Priority to catch the next wave of his/her choice. Once he/she catches a wave then the next surfer in line has Priority. If surfer A is closer to the peak on a left hander, surfers B and C should all be looking to their right to wait and see if surfer A is going to catch the wave. Surfer A knows he has priority and is only concerned with communicating to B and C that he is going left on the wave so they don’t “drop In” on him. Conversely, if the wave is a right and the surfers are in the same lineup order, surfer C now has priority and all surfers are looking to their left to see if surfer C is going to catch the wave. If surfer C does not go on the wave, surfer B now has priority and will have the honors. If a surfer is unsure who has priority on a particular wave, they should not be paddling for the wave. There should only ever be one surfer on a wave. After the surfer with priority catches a wave, the line up will shift to be one surfer closer to the peak. Surfers in the lineup should never paddle from the end of the line to the peak after another surfer gets a wave (paddling around the pack is not a good way to make friends or earn respect). Priority rules should always be followed when surfing. This will keep everyone safe and ensure your session is a positive one. Dropping in on another surfer means that you’ve decided to take off on a wave that another surfer is already riding. Drop ins are the most common mistake beginner and intermediate surfers tend to make because they are not informed about etiquette. Knowing which surfers have priority on a wave is critical. Having said that, drop ins are one of the easiest problems to avoid. When paddling into a wave, a surfer should always look left, right (just like crossing the road), and straight ahead (like skiing down a mountain) to make sure they are not going to jump out in front of a fast moving object (like a car or a surfer) or accelerate into a stationary object (like a tree or someone paddling out). If you see another surfer already up and riding on a wave, you should not be paddling for the wave. If you see someone paddling out directly in front of you, even if it seems far enough away, back out of the wave. By looking both ways and being aware of your surroundings, you can avoid getting injured, injuring someone else, or getting scolded by another surfer.